Recently I started noticing how junky my kitchen was. Piles grow and sit on the counter until I become so used to seeing them, they just blend into the background. Some stuff has been around for years and has become worn out and sad looking. The drawer I’m used to rummaging around in has all kinds of junk I never use. How about the empty wall in the corner that I never got around to decorating? Yup, total blindness to what it really looks like. Time to eliminate the piles, worn out towels, dead plants (eek! ), unused appliances—they all needed to go. After much thought and measuring and sorting, I decided to buy a few new items to spruce things up. I also needed some better ways to organize cabinets and drawers. At one point, I actually took everything out of the two drawers I was working on to sort out all the junk. It’s always kind of embarrassing to see the weird, trashy items that have been stored for way too long—what was I thinking?! Then I tried out different organizing ideas to see how I might want to divide the drawers. I measured and moved, and finally came up with what I thought would work. I did the same thing under the sink. This involved a lot of running up and down the stairs to measure and consult possibilities on Amazon. Make SURE the sizes you order will fit in your actual space! I finally ended up buying three drawer units for under the sink (large, medium, two drawer unit), plus a shelf, and a new wrap holder. For the larger drawer, I bought an adjustable drawer divider because I couldn’t find anything that was quite right. I decided the smaller drawer just needed a small box to create a divided space. For the counter, I bought a pantry rack for the cutting boards, a fruit basket, a hanging shelf unit, and a small spice rack. ), my packages arrived and I got to work. I assembled the drawer units, emptied everything from under the sink, and wiped it out. I sorted out all the trash and got rid of a few things. Then I put my units in to see if they fit—yes—accurate measuring for the win! I filled up my new drawers, trying out a few different arrangements. Then I attached the new bag/wrap holder and filled it up. Under the sink—check! I moved on to the drawers where I emptied everything out, sorted, and wiped the drawers. Then I snapped the drawer divider together and put it in—no tools needed. I still think there are too many things in the drawers, but since there are only a few drawers in the kitchen, that’s the way it has to be. The biggest win with the drawer dividers is that everything doesn’t just slide around together anymore. Things pretty much stay in place. Finally, on the counter, I cleaned up the piles and wiped everything down. Then I attached the shelf unit to the wall and set up the other items on the counter. The cutting boards don’t look that different, but now they don’t slump over and fall when some of them have been used. I’m delighted with the shelf unit on the wall. It just adds so much color and pizzazz to that corner. Gotta love blooming flowers in the kitchen! The biggest help for most spaces is to use some kind of divider or container to keep things organized. In drawers, use dividers. 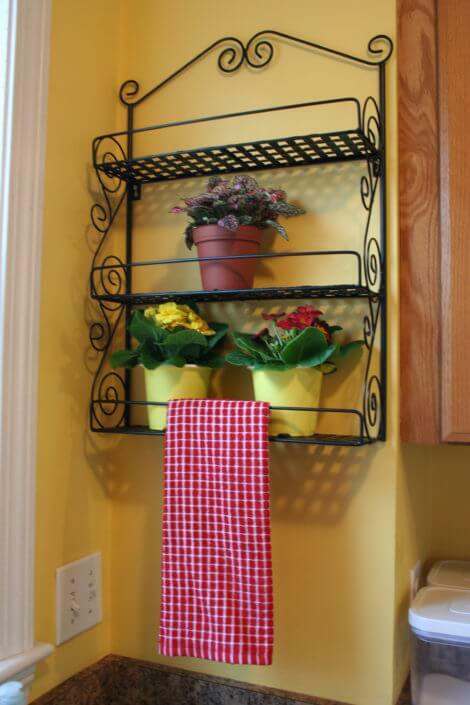 In cabinets, use racks to hold lids, pans, and cutting boards upright. On the counter, try using baskets or bins to keep like items together. Interested in some of these products? You can shop for the products mentioned in this post below.